Click here to watch a video of these packs in action. The ultimate upgrade for your Brushless E-Revo. This is for 1 pair of our new 6000XL 11.1V lipo packs. One left side and one right side custom wired to fit the E-Revo battery compartment. 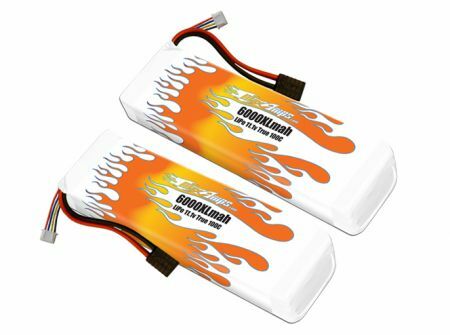 These packs are NOT for a brushed E-Revo and will only work with brushless upgraded vehicles. No tray modifications required. There is no better pack than this if you're looking for the ultimate combination of power and run time. This pack takes up the WHOLE tray, not just part of it. Long run times while holding incredible voltage under load. These packs will make your brushless Traxxas E-Revo scream! If you're looking for an insane amount of power, these are the packs for you! Click here to view RC Car Action Magazine's 65mph test results. I Am Very Happy And Excited With Your Item I Received From You And The Item Is Very Countable And Enjoyable. Thank You For Your Pleasant Time And Valuable Items. I have a set of these I use in my fazon and they are amazing. tons of power lots of punch. good run times and top quality. absolutely awesome batteries.